Baked Eggnog Donuts – an Easy Holiday Dessert! Hey friends! I’m managing to sneak one more festive holiday dessert in before Christmas! Can I get a virtual high five? Don’t have to twist my arm to use some eggnog (or to eat donuts, if I’m being honest here). The countdown is on in our home. I didn’t grow up enjoying eggnog but, like I mentioned before, it’s something hubby and I regularly stock during the holidays. It’s a good thing that it’s only around for a month or so because it definitely is a decadent treat. Plus, this is a great recipe to use leftover eggnog you may have! Mix together dry ingredients (sugar, flour, baking powder, salt, cinnamon and nutmeg). Mix together wet ingredients (eggnog, melted butter, egg and rum extract). Whisk wet ingredients into dry ingredients, scraping bowl with a spatula to get all the batter. Pour batter into prepared (aka greased) donut pan and bake. Cake flour was used here, but all purpose will work in a pinch. For more info on when you should use a particular type of flour, this is a great guide. Rum extract was used, but if you don’t have that on hand, no worries! Use vanilla extract. Regular eggnog was used (aka not ‘light’). Use whichever variety you prefer. If you want to add another element of flavour to these baked donuts, brown the butter. I talk about it here. Let the donuts cool completely before glazing. Otherwise, the glaze will ‘melt’ into the donut. Garnish with sprinkles as soon as you ice the donuts so those suckers will stick. These donuts are best enjoyed the day they are made. Hope you’ve enjoyed these easy eggnog baked donuts! Stir together flour, sugar, baking powder, salt, cinnamon and nutmeg. Lay to one side and preheat oven to 425 F.
In a bowl whisk eggnog with egg, melted butter and rum extract. Pour eggnog mixture over flour mixture, whisking until combined. Spray 6 unit donut pan with baking spray and distribute donut mixture into. Bake 6-7 minutes or until wooden skewer comes out clean when inserted. Let cool completely before glazing. When cool, invert donuts, one at a time, into icing sugar mixture. Place on wire rack and garnish with sprinkles immediately before icing sugar dries. Enjoy! Cake flour was used here, but all purpose will work in a pinch. Rum extract was used, but if you don't have that on hand, no worries! Use vanilla extract. Regular eggnog was used (aka not 'light'). Use whichever variety you prefer. If you want to add another element of flavour to these baked donuts, brown the butter. Let the donuts cool completely before glazing. Otherwise, the glaze will 'melt' into the donut. Hi Hannah! Use 1.5 tsp of rum extract (and if you don’t have that on hand vanilla extract will work in a pinch). Thanks so much for stopping by! Hope you love the recipe 🙂 Happy Holidays! Bring on the holiday eggnog! These donuts look festive and bright and perfect for celebrating. Great idea to bake them rather than fry them. I agree 😉 Thanks Holly! Happy Holidays! 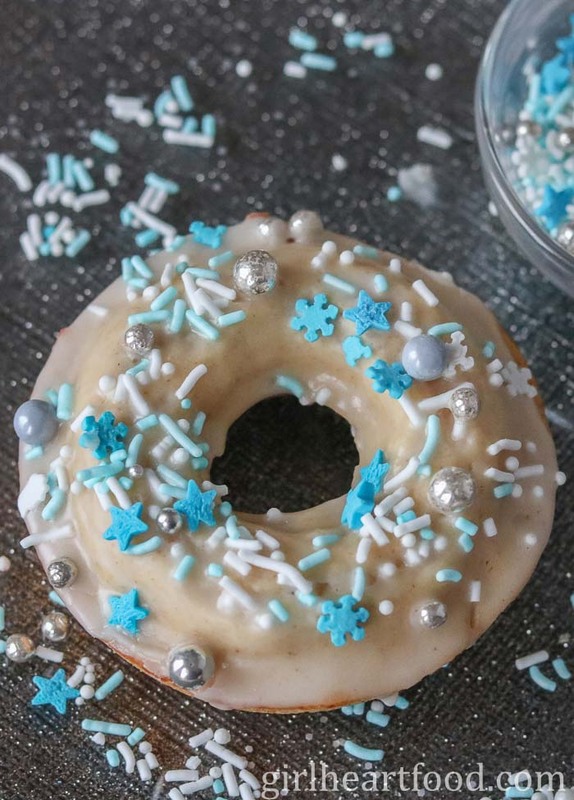 I love eggnog anything and these donuts are so pretty and totally up my alley! I am tempted to buy a donut pan simply so that I can make these 😉 I hope you have a wonderful christmas Dawn! Those donut pans are so convenient and I love how they take so little time to make! Hope you get a chance to try these, Vanessa 🙂 Happy Holidays!! I have the mid-afternoon munchies right now and I REALLY want one of these donuts!! Definitely a virtual high five to you for this holiday beauty! I’m thinking breakfast Christmas morning!! I can literally picture myself relaxing over the holidays dunking one of these beauties into my latte. 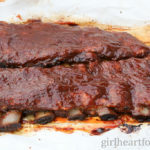 And quick to make, the recipe looks very easy to follow for this average baker over here! Girl, you know I’m ALL about the baked donuts! These are a must-try. We always have eggnog on hand during the holidays too. Hubs loves it with rum, and I love it in baked goods and just straight up! I will definitely have to try these – complete with beautiful sprinkles!! Yes!! Rum and eggnog go so well together. If you were up for it, you could sub out some of the milk in the glaze for rum…just saying 😉 Thanks, my friend! Believe it or not but I’ve been thinking of making eggnog donuts as well. And guess what’s now? I don’t need to think anymorer; I’m pretty positive you’ll ship a 1/2 of dozen to me, right? 🙂 These bad guys look and sound fantastic! Haha! I’d be happy to 😉 Thanks Ben! What a pretty treat! I had coconut milk eggnog last night and it was REALLY GOOD! I’ll bet it would work in this recipe too! Pinning! Cheers to you, you hubby and your fur baby. Have a wonderful Christmas! Dawn, I think eggnog is a perfect flavor for holiday baking – I’ve never used it before but these donuts are making me want to run out and buy a jug of it! I can almost taste them! Happy to hear that, Laura! Gotta enjoy eggnog while it lasts 🙂 Thanks so much! Eggnog donuts! What a great idea, perfect for this holiday season! Perfect for dessert or even better for breakfast! These are perfectly acceptable in lieu of cookies:) In fact, I prefer them. The decoration is beautiful too! Way to go. Perfectly festive and such wonderful seasonal flavor Dawn! Haven’t made homemade doughnuts in a while! You’re inspiring me! These are so pretty Dawn! I love those wintery sprinkles! I always have eggnog on hand for the holidays. I love baking with it, and I will indulge in a little too. This year, I’ve actually been enjoying almond nog. It’s not quite the same, but definitely satisfies the craving. I hope you’re enjoying the last week leading up to Christmas! These are so festive and delicious looking, Dawn! YUM! I think I told you that I just tried eggnog for the first time the other day…it was delicious, thick and creamy! So pretty and loving the seasonal eggnog here! The blue sprinkles are fabulous!! I have been loving baking with eggnog. I think I like it even better in a batter than in a glass. 🙂 These are very pretty and such a fun & festive holiday treat! Well, I will not be leaving these on Santa’s cookie tray because there’s no way they’d last long enough. It’s been way too long since I made donuts and these sound like a great way to get back into making them! YUM! Have a great week, Dawn!